Road Safety Week – tell us what’s happening! Road safety teams across the country are gearing up for Road Safety Week 2018 which gets underway on 19 November. Throughout Road Safety Week we will be running a daily news update covering what’s happening around the country. Simply send details of your activities by email to Edward Seaman at Road Safety News and we’ll feature them in our roundup. 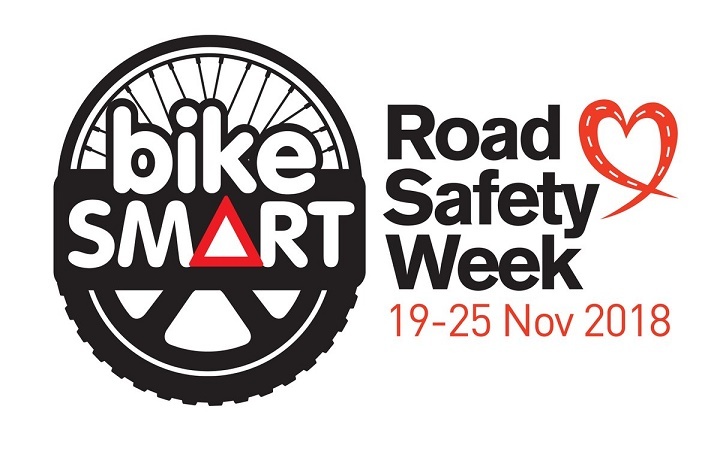 Using the theme ‘Bike Smart’, Road Safety Week 2018 (19-25 Nov) will seek to raise awareness about the importance of protecting those on two wheels. Areas of focus will include safe riding behaviours and the importance of appropriate training, clothing and equipment. Warwickshire’s road safety team is using Road Safety Week to launch a new campaign, ‘THINK who’s looking’. 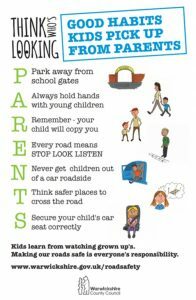 The aim is to encourage parents, grandparents, carers and other adults to think about how their actions impact on children – and highlight the importance of forming good safety habits when out and about with children near roads. The campaign is based around a set of humorous postcards, depicting the good and bad habits that a child might pick up from a grown up. Parents of children in reception classes across the county will receive a postcard, height chart and colouring sheet as part of the campaign. Accompanied by civil enforcement officers and Met Police officers, Hammersmith & Fulham’s road safety team will be visiting roads around schools and in other locations where there are road safety issues such as dangerous or inconsiderate driving and parking – and where people are ignoring parking restrictions such as ‘school keep clear’ markings. 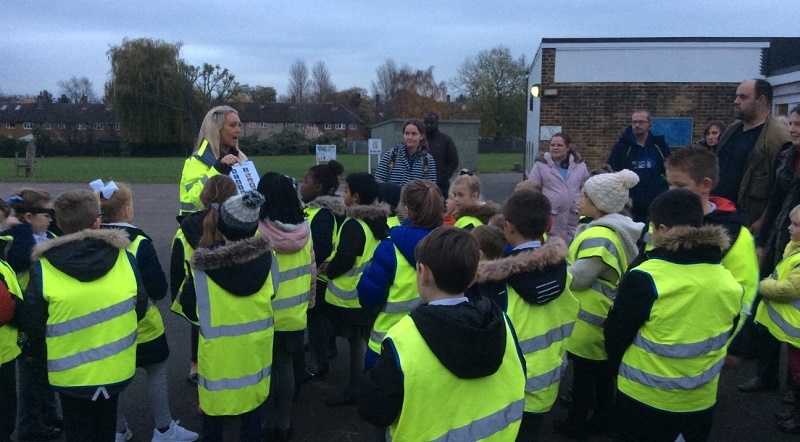 The partners will also visit locations where residents have expressed road safety concerns, including school crossing patrol sites – and will target motorists and cyclists who ‘put themselves and others in danger through their behaviour’. In Essex, the Safer Essex Roads Partnership (SERP) has planned a comprehensive programme comprising more than 40 activities and initiatives. These include activities in infant and primary schools across Essex, Southend-on-Sea and Thurrock covering Bikeability training and pedestrian training in the form of a ‘twilight trail’. There are also sessions for year six primary pupils in Thurrock, focusing on how to stay safe when near HGVs and other large vehicles. There is also a week-long road safety static display at The Forum in Southend-on-Sea; various young driver events in Colchester, Purfleet and Braintree; and Community Speedwatch events outside schools in Chelmsford, Southend-on-Sea and Harwich. In the City of London, the corporation’s road safety team is joining forces with the construction firm Sir Robert McAlpine, City of London Police and the Met Police to run a lunch time community roadshow to remind road users to be #BikeSmart. The roadshow includes: the opportunity to sign up for free ‘Cycle Skills’ training; a ‘Virtual Reality Exchanging Places’ event which enables cyclists to see for themselves the blind spots from a HGV driver’s perspective; and cycle security marking by the City of London Police. The road safety team is are also working in partnership with Living Streets, TfL and Sir Robert McAlpine to organise a series of walks across the City highlighting road safety best practice in construction. Just thought that I would let you know how I went on with my counting of offences or danger created by cyclists. Over the last 5 days I have seen 3 cyclists failing to stop at red lights, several more, 3 in fact leaving the road and carrying on over the pavements and crossings through lights, 7 cyclists without lights at night and all wearing dark clothing, 4 cyclist on the road or on the pavement riding with no hands on the handlebars and 2 of them were on the phone. One was texting [ using both hands to do so] One cycling with a young child some 4/5 years old swaying uncontrollably under his arm and only steering with one hand on the road on the wrong side of the road. Whilst walking I missed by inches by 2 cyclists coming from behind me on the pavement. Finally several 10/11 year olds, children on scooters, no lights, no brakes and in the dark on the road speeding down from a railway bridge and on the main road. Not bad for less than one week. Joe Irvin Chief Executive of living Streets said in another publication on this site that ‘people, walking and cycling do not cause road danger.’ I think he was wrong… very wrong… extremely wrong. He obviously needs to get out more or just open his eyes. The Keep Clear zig zag markings outside schools for not stopping or indeed no parking are not compulsory in law. They are only advisory at the best until there are legally recognised yellow ‘no stopping’ signage adjacent to them. Police would be able to advise on them as would any interested party buy no actual offence is committed merely by stopping on them. Once a sign is agreed and placed alongside then an actual offence is committed and the police could take the necessary action. From the examples, the emphasis seems to be on advising vulnerable road users on how to stay safe, but apart from a Speedwatch mention, no one seems to be targeting those who are real threat – the motorists themselves. In my home town I am starting a diary and noting all the offences and dangerous acts that cyclists commit in and around my town like riding no hands or use of devises. or no brakes or not lights at all in darkness or furious riding in public places etc. I am doing my little bit and whatever I can to make my home town a safer place for all road users..